Located at the heart of the School, the Management Information and Resource Centre (MIRC) is the library and information service of the Cranfield School of Management. MIRC has a dedicated team of information professionals to support the School's MBA, MSc, PhD and DBA students, along with faculty, staff, executive development clients and alumni. Staff work closely with faculty to ensure that our services reflect the needs of our user groups. Our extensive collection of electronic resources for learning and research is amongst the most comprehensive to be found in any management school. 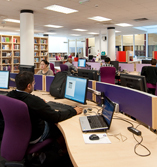 MIRC is part of Cranfield University Libraries and is open to all University members. Electronic access to our journals by title. A-Z of MIRC’s electronic business resources. A-Z of all University Library subscription resources. CCNT login required. Click here to book the MIRC Media Room - or a study room at Kings Norton Library. Support Off-Site Service - Dedicated help & support for off-campus staff and students. CCNT login required. Cranfield Online Research Data – a repository for preserving your research data. Full-text access to Cranfield Masters theses.CCNT login required off-campus. The Cranfield Collection of eResearch. A digital repository of research output from Cranfield University.